For Christmas Eve, Chris and I had had plans to drive up to Duluth and spend the holiday with his parents. However, it was not to be, as a snow storm came that day and we decided it wasn’t worth the risk to be on the road for two and a half hours. Because of the change of plans, we were then able to go to my grandpa’s house to spend Christmas Eve with my mom’s side of the family. There was only one problem: I didn’t have a gift for the white elephant game. No problem, though. I’d just baked lots of gingerbread cookies, so I boxed them up and put them in a gift bag. I was unsure of the dollar amount that the gifts were supposed to be, though, so I threw in a little something extra. Okay a lot extra: a coupon for a handknit item of the recipient’s choice. When we got there I found out that the spending limit had been $10, and most people got gag gifts. So, guess which gift was the most fought over and stolen in the stealing round? Yep, the handknit coupon. People would yell out, “Where’s the socks?” or “Where’s my scarf?” when they rolled doubles and jumped up to steal. It was great. My cousin’s husband (so my cousin-in-law?) got the gift in the end, and asked for a pair of socks. On my coupon I specified that there would be a 3-4 month waiting period for the socks, and, well, it’s been a lot longer than that, and he still hasn’t gotten the socks. But they’re finally completed! I actually had to rip out and re-knit one whole sock after grossly misjudging the size, so that’s partly why they’re so late. And, finishing those has given me the chance to finally start on a pair of socks for Chris, which he has been looking forward to almost since we started dating. These are going much faster, now that I have a “weekend” built into my weeks in the middle of the week. Yarn: Plymouth Happy Feet. Color #18 for Chris’s socks, and I don’t know for sure the color for the Christmas socks, but it looks like #3 on this page. 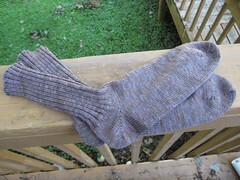 Pattern: Wendy Johnson’s Generic Toe-up Sock Pattern. Yarn review: This was the first time I’ve used this yarn, and I really like it. It’s got a very fluffy, squishy texture compared to what I’m used to. 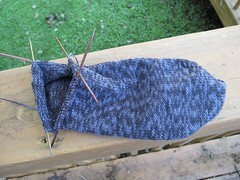 The socks feel really soft, and it was really satisfying to knit with. I purchased the yarn at Yarn Harbor in Duluth. It’s been awhile since I’ve woven anything, mostly because I had a weaving mishap that led the loom to sit, poorly warped, for months. Initially I’d meant to weave a scarf with all these colors of leftover yarn that I had. I don’t even remember what happened, but something caused one side of the warp to be crazily tight tensioned, while the rest of it was normal. Since I was at the beginning of the project, I tried to go back and re-tie the offending warp threads to even out the tension, but they kept tightening up on me again. And so the loom sat. About a month later, I finally did something about it. I cut off what I had of the project and folded the loom up. Yesterday, I finally went about fixing it up and re-tying the warp. I had to re-thread it through the heddle again, too. Time consuming! 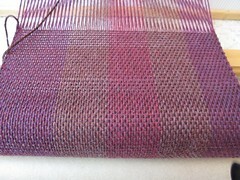 But soon enough I was weaving again. Unfortunately, all the issues, and the fact that this project was just a hodgepodge of colors I had lying around, have left me rather unenthused about this project. Maybe I’ll make it into a bag. I’m making some progress on Muir. Slowly. 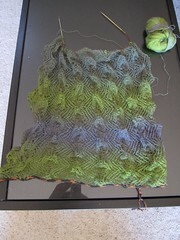 I can tell it’s going to be gorgeous when it’s all finished and blocked, but it just takes so long to knit! Knitting lace has a different feeling to it, too. For example, when knitting socks or something else similarly tightly knit, I love the satisfaction I feel from seeing the fabric forming right beneath my hands, and the feeling of manipulating the stitches, pulling yarn into the right place. With this lace, it’s so wispy and light that it feels insubstantial. Stuff is going on, and I’m making pretty fabric, but I don’t feel it as much. Plus, it makes my hands and arms hurt after awhile, so I have to limit my work on it. When I weave and knit, I like to have something to watch. Since I had to cut Netflix out of my budget, I’ve had to rely on Hulu, and I don’t like that many shows. Last night I decided to try out 10 Things I Hate About You the TV show, to see how it stacked up to the movie. As far as cheesy teen TV shows go, it’s tolerable, but it kept making me want to watch the real thing. I love that movie, and nothing can really compare. Still, it provided for hours of solid weaving and knitting entertainment.